No one is more qualified to write 'Army of Darkness: Furious Road' than Nancy Collins (Jason Vs Leatherface Swamp Thing, Vampirella). Who better to guide us through this "deadite apocalypse" full of monsters, demons, and one wise-cracking, chainsaw-for-a-hand wielding protector of the spell book that could change everything. When we last saw Ash he was confronted by an eclectic group of survivors looking for the Necronomicon. According to Eve, the daughter of Dracula, the book includes a spell that could send the demons back where they came from for good. Ash was skeptical but they were able to convince him to join them in the only sanctuary where humans and monsters co-exist, a place dubbed "Alive." There, werewolves, vampires, and humans help each other while taking on the dreaded demons. You don't have to be an expert on 'Evil Dead' lore to jump on this series. It retains the same campy humor and horror the movie franchise is known for but that stems from Ash's acerbic humor and joy of killing demons. 'Army of Darkness: Furious Road' is a good time. Ash may be a meathead but Collins surrounds him with serious and diverse characters who aren't taking the apocalypse as lightly. It's a good balance of humor, gore, and plot development. Kewber and Schimerys Baal provide the great illustrations. Kewber's attention to detail and energetic layouts drive the story keeping the acton moving. Where Kewber seemingly thrives and probably relishes are the fight scenes especially when the good guys throttle the deadites. It's a gorgeous gore-fest aided by Schimerys' bold colors. 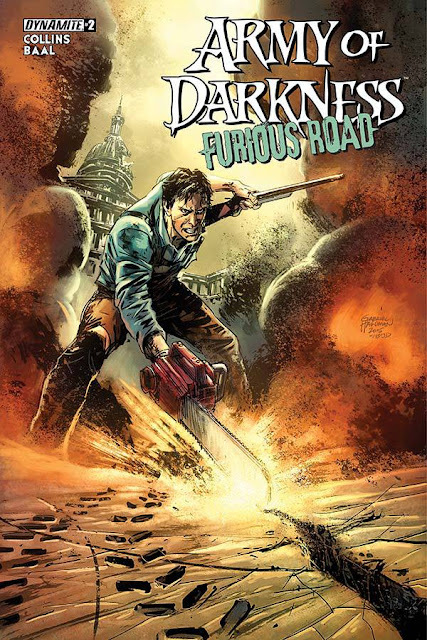 'Army of Darkness: Furious Road' is a fun expansion of the 'Evil Dead' mythos. Collins has given us the Ash we know and love stuck in the middle of an exciting, dangerous, and crazy new environment. The Baals provide the incredible art and energy. It's like 'The Walking Dead' with laughs and none of the pretension.